Diners, Drive-Bys & Droids: Our FandomFest 2017 Outtakes « Midlife Crisis Crossover! 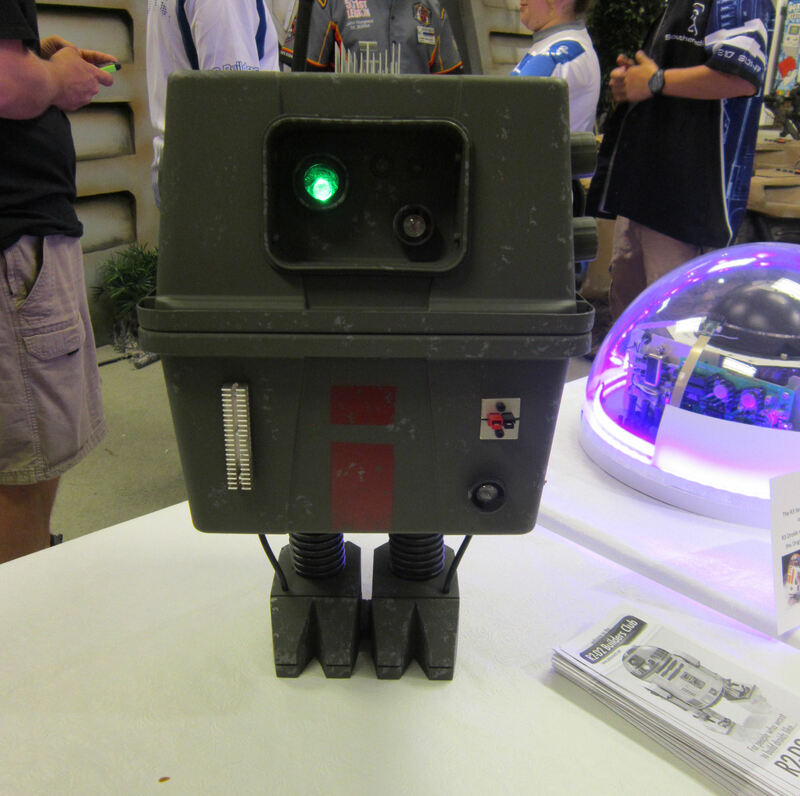 One of the largest, showiest, niftiest FandomFest exhibits was provided courtesy of the local chapter of the R2-D2 Builders Club, an international league doing for those cute Star Wars droids what the 501st Legion does for Stormtroopers. Tabling just inside the door and right along the Will Call path, the Club was a welcoming sight for any and all fans upon arrival. 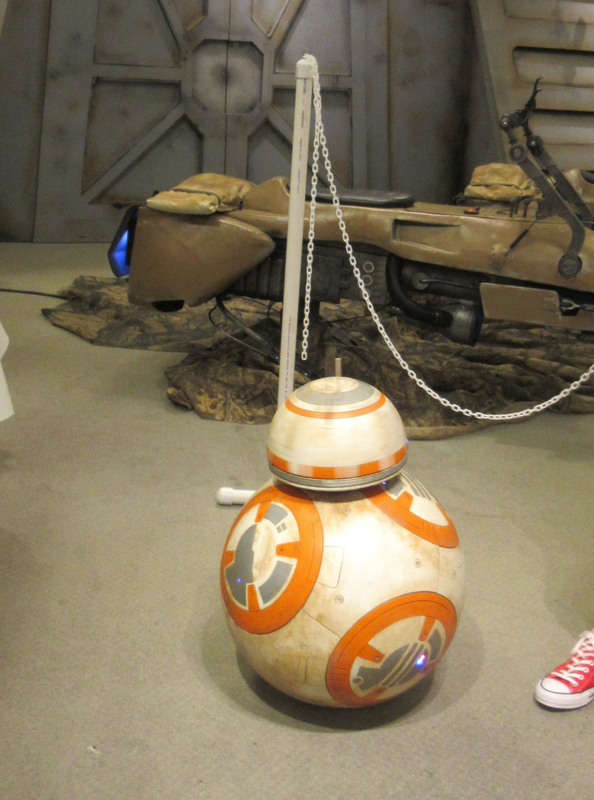 Sure, we could’ve showcased the same old Artoo, or we could board the BB-8 bandwagon and lavish attention upon this functional doppelgänger. Yeah, let’s do that. So cute! Not everyone sticks to the traditional chrome-dome design. 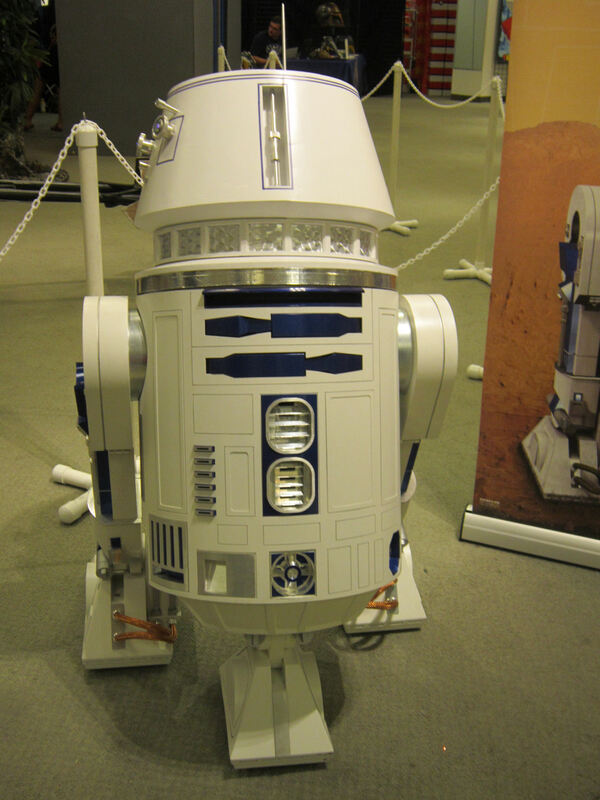 R5-D4 was the trendsetter of the toothpaste-cap-head scene, where its influence has extended to a variety of models. 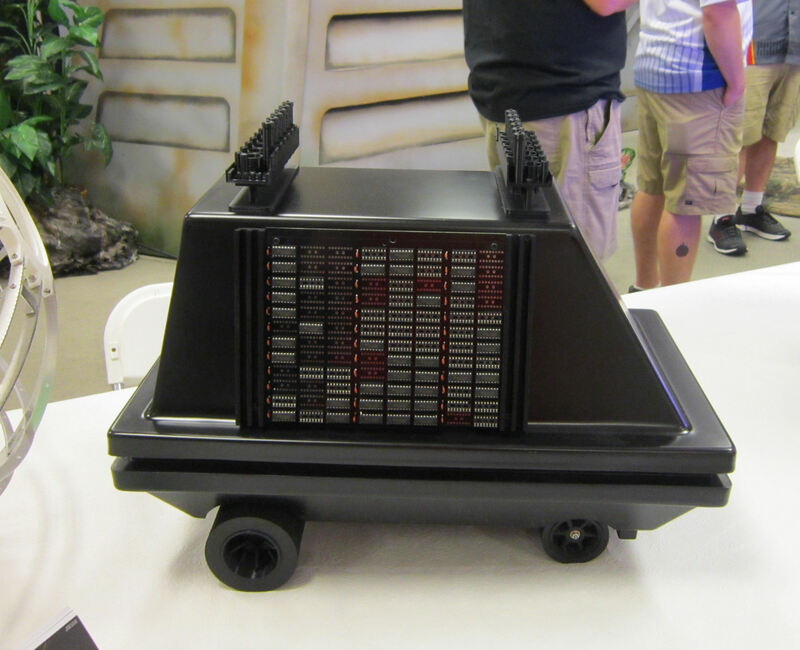 As a kid I had a couple dozen Star Wars action figures (and my wife still has hundreds), and one of my favorites was the Gonk Droid even though it had literally two points of articulation. 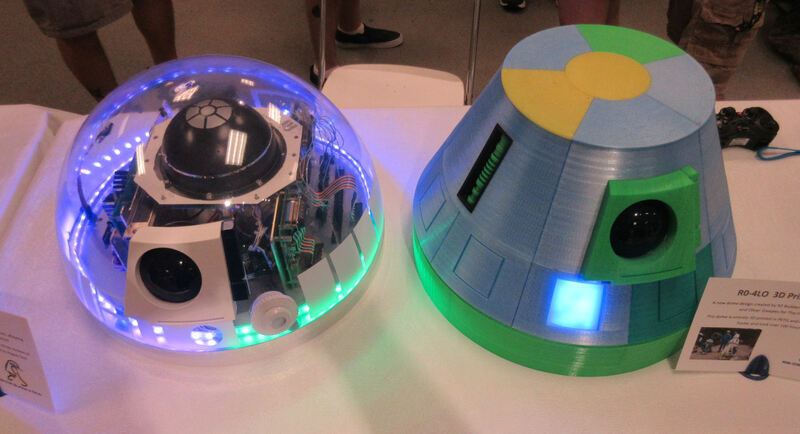 One of those amusing, nicely detailed Mouse Droids, built actual size. 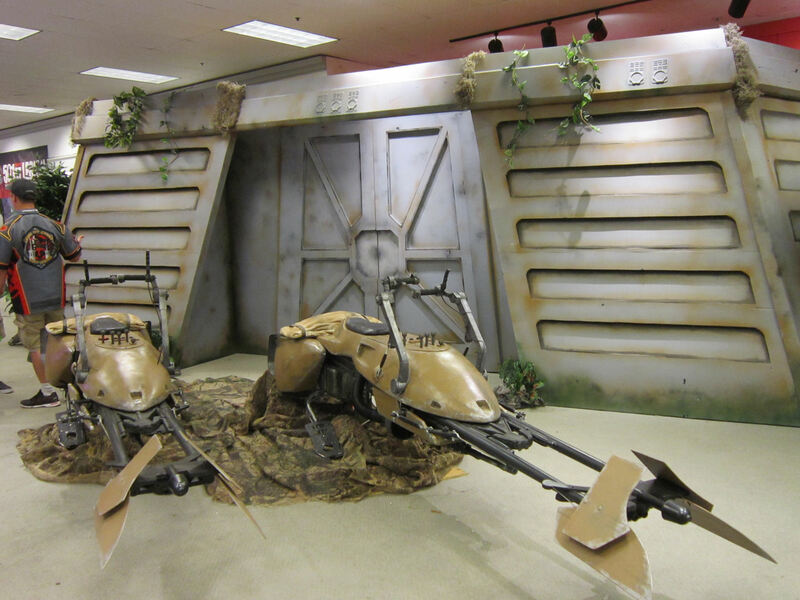 For fans who prefer larger displays of Lucasfilm machines, this former Macy’s clothing section converted seamlessly into a speeder bike showcase. We intended to take more photos of the drive to and from Louisville, but we found that stretch of I-65 lined on either side with numerous obstacles and eyesores that drove us to distraction. We’d also considered fitting in a tourist attraction or two, but we ultimately decided we’d rather return home ASAP after lunch and reclaim what was left of the weekend. 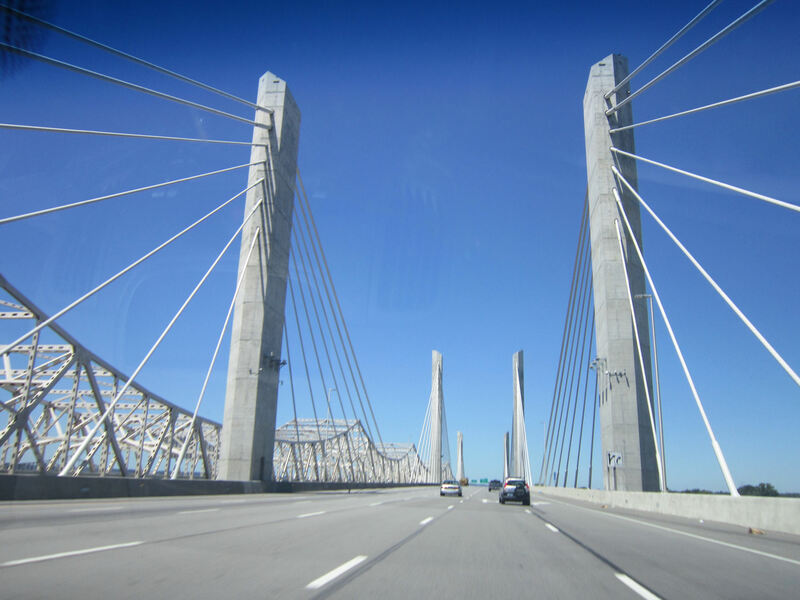 A new I-65 bridge was recently constructed across the Ohio River. It looks cool but gave them an excuse to turn this Indiana/Kentucky access point into a toll road. Huzzah. 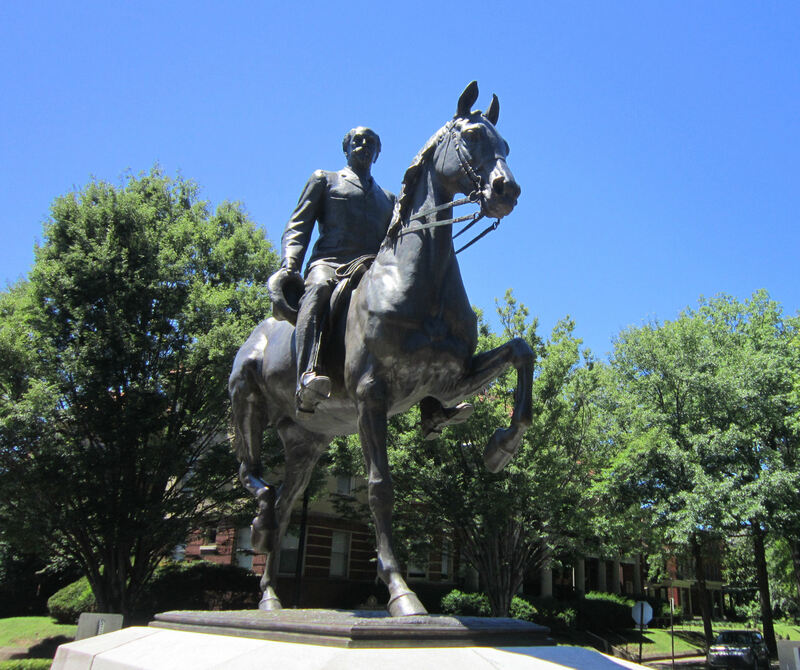 After lunch, our exfiltration path took us to a roundabout with a surprise statue we didn’t know was there, commemorating Brigadier General John Breckinridge Castleman. The name was unfamiliar to us, but the internet tells us Castleman served as a major with the CSA cavalry till he was captured. Lincoln stayed his execution and exiled him to France instead, which ended when President Andrew Johnson pardoned him in 1866. The statue might be in honor of his antebellum contributions to the community and state, but the CSA receives prominent mention in the statue’s plaque, so that part was very important to someone ’round there. Um, we saw more than enough “Hurray for CSA!” sights on our 2015 drive through Alabama and Mississippi, thanks anyway. 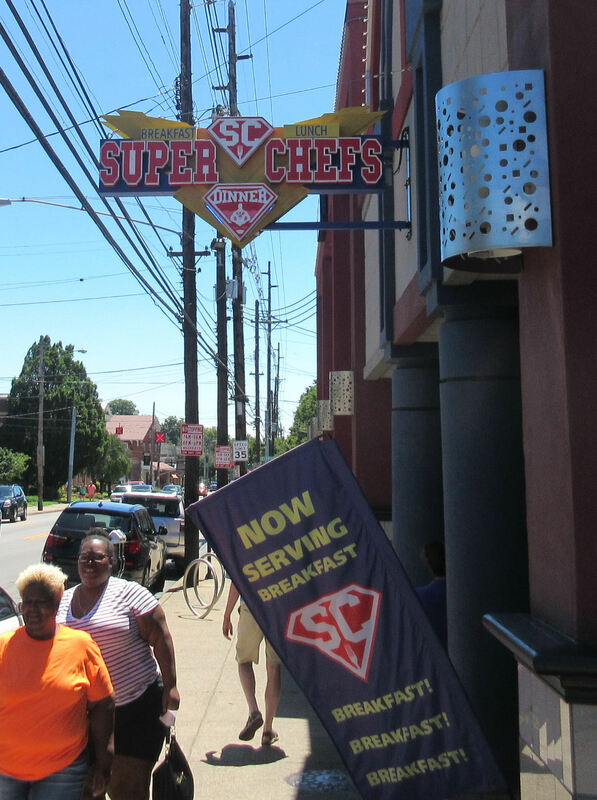 Lunch itself was a different sort of fun, at a place called Super Chefs. It was twenty minutes north of FandomFest in the Highlands, Louisville’s own small, dense, trendy neighborhood of shops and culture. (Our version in Indianapolis is called Broad Ripple. I recognize that vibe.) 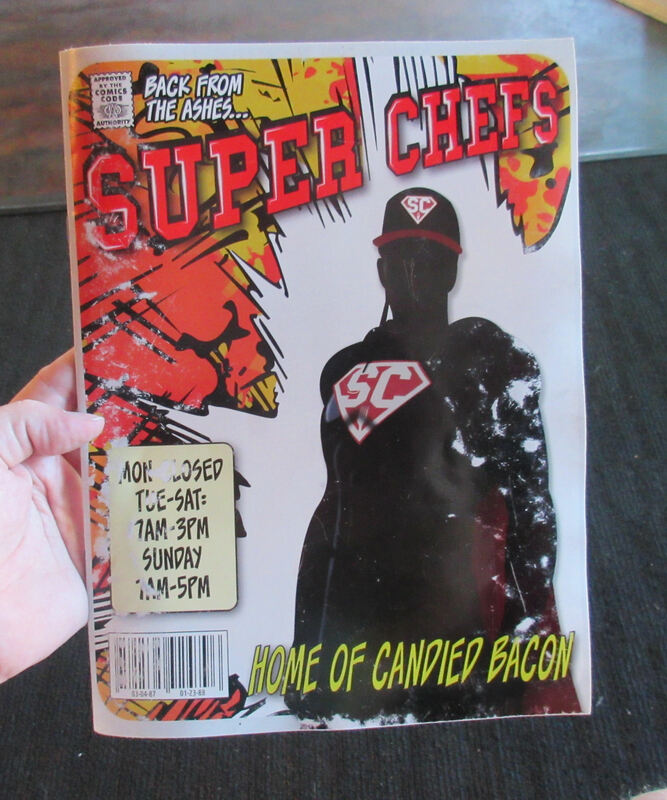 Super Chefs is a superhero-themed restaurant, where some dishes bear names known to geeks (the Liu Kang! the Harley Quinn! the Mister Sinister!) and the decor follows suit. I refused to pass up this opportunity while we were in town, especially since they serve breakfast till 3 p.m. on weekends. Oddly, the servers don’t wear costumes, just T-shirts — some of which bore Scripture on the back, including Proverbs 3:5-6 and Colossians 3:23. On one wall is a large, Last Supper homage in which Marvel and DC heroes mingle (plus Todd McFarlane’s Spawn), all captioned “Food, Faith & Superheroes” that orients discerning patrons to the true heart of the restaurant. Breakfast is kind of their thing, but they’re also open for dinner. 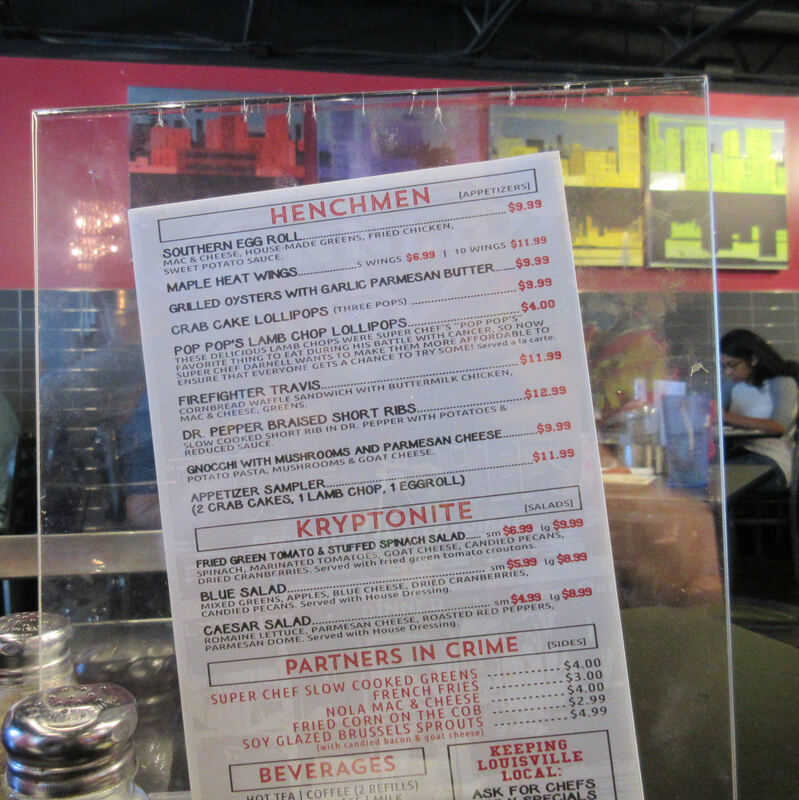 I appreciated the menu’s attention to detail, down to the comic book UPC code and obsolete Comics Code Authority seal. A few of their offerings, and the headings that celebrate the theme. One ingredient above all others makes its way into numerous dishes: candied bacon. Before our local Bob Evans picked up on this trend and decided it should be commercialized, local restaurateurs nationwide were blazing the trail and making it cool. Within another year or so I expect we’ll be seeing candied bacon ice cream, candied bacon Pop Tarts, candied bacon Quarter Pounders, and candied bacon jokes on stale network sitcoms. Not that I’m complaining. Yet. I’m getting to an age where it’ll have to go into the “moderated foods” queue, though — no one-pound piles of candied bacon as an appetizer for me, I’m afraid. But Super Chefs put it to decent use in our respective meals. 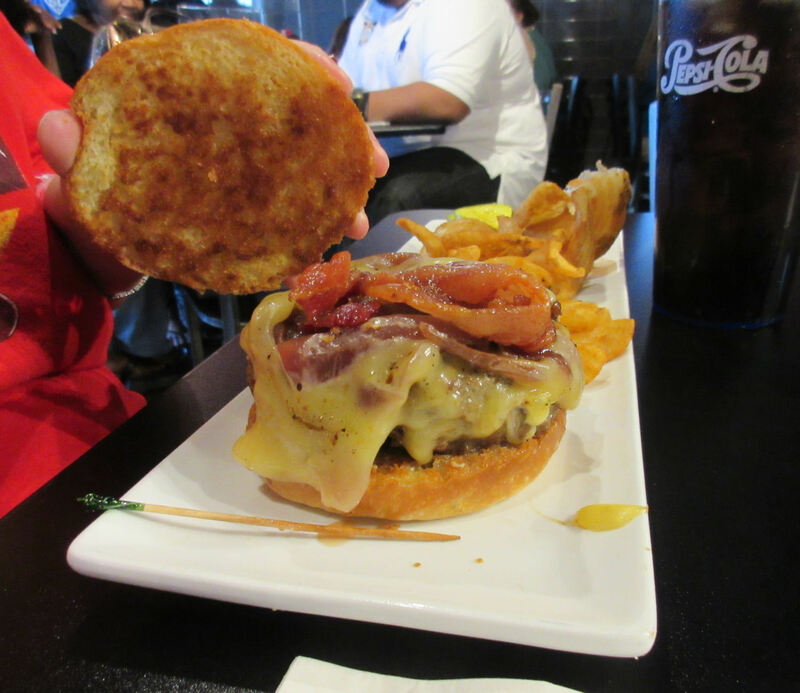 Anne asked for a “plain” cheeseburger and received this formidable sandwich and artfully sliced fries. It didn’t blow her mind, but it filled a need. As for mine…behold the Juggernaut. 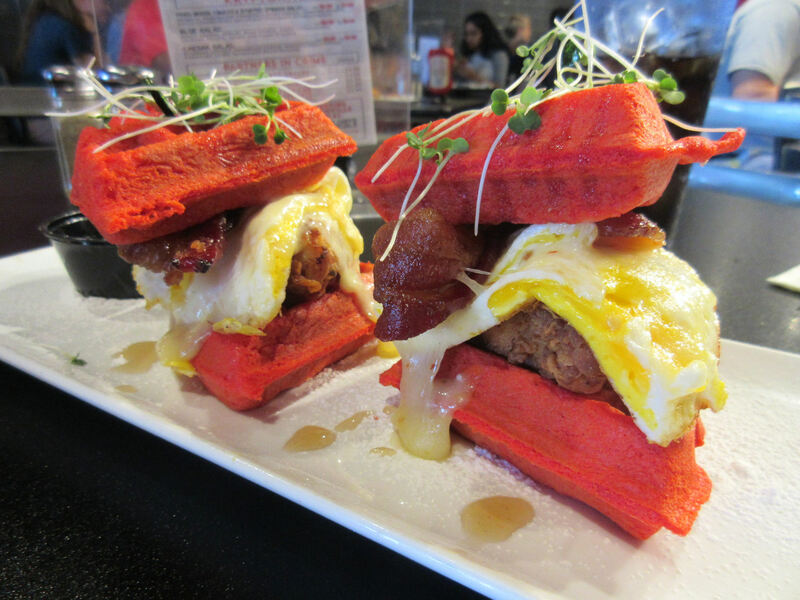 Fried chicken, egg, honey, and pepper jack cheese served on red waffles with fresh garnish and a side of syrup. Oddly, only one of the two halves had cheese on it. 12/10 anyway. …and that’s the story of why we didn’t bother with the infamous mall food court. In fact, we never set foot in the mall beyond the Macy’s entrance. It’s not really why we were in town. A few generous folks, including a nice couple in the photo-op ticket exchange line, gave us fantastic ideas for Louisville sightseeing beyond what we’ve already done (cf. Zachary Taylor’s gravesite, or that time I rode the Belle of Louisville as a kid). We look forward to exploring those places in our future visits to the area. Well, maybe not the CSA guy’s block again, but who knows. Updates as they occur! « FandomFest 2017 Photos, Part 2 of 2: Cosplay!